Here are the findings from the recent news of Vodafone supporting cancer research, through smartphone distributed computing. There are more key details in the following article below. The Vodafone Foundation in Australia helps charity groups harness the power of mobile smartphone technology, to conduct research and better the social health of Australians. In Australia Cancer researchers and scientists are limited by high financial costs which arise from the use of supercomputers. By partnering with the Vodafone Foundation, they can lower costs and continue their work. The Dream Lab is a free application which uses the processing power of your smartphone when it is running idle at night or during a charge. The Vodafone Foundation in Australia helps local and international charities utilise and harness the power of mobile smartphone technology, to create a healthier Australia. To Vodafone, this is known as the “power for good”. Vodafone at the moment supports the leading diabetes and heart institute, Baker IDI, with the goal of raising awareness of the health risks associated with prolonged sitting. Awareness is spread through a Smartphone App which gives Australian’s access to a tool which they can use to monitor the amount of time which they spend sitting down, make changes to their lifestyle, exercise more and improve their overall health. The Vodafone Foundation also supports the “Hello Sunday Morning’s” campaign which aims to foster a better drinking culture, in doing so via a three-year partnership, with funding being spent on smartphone and handheld device app’s which help to empower Australian’s with sensible drinking habits. Vodafone Australia is also proud to support Australian men’s charity “Beyond Blue” and the St John Ambulance, which help to save the lives of Australian’s in need all around our great nation. When was the Vodafone Foundation Established ? The Vodafone Foundation Australia was established in 2002 and to date has donated more than $22 million, which has been spent supporting the local community, non-profit organisations and Australian charities. Primary charities which have benefited from the generous support of the Vodafone Foundation are Red Dust Models, Musicians Making A Difference through the 12-year World of Difference program, and Oz Harvest. The Vodafone Foundation Australia is one of 28 Vodafone Foundation’s globally which use smartphone technology to improve people’s lives through social change. What is the Dream Lab App ? To everyday Australian’s cancer is something which affects the people which we hold dear and love. But did you know that you can help speed up cancer research, simply by going to bed and letting a smartphone app run in the background? Cancer researchers are limited by the high financial costs and access when it comes to complicated research using supercomputers. In partnership with Australia’s leading scientific organisations and The Vodafone Foundation, there has been an application created called the Dream Lab. The Dream Lab is a free app which uses the processing power of your smartphone when it is running idle, such as when you are resting or when your phone is not being used during charging. For Vodafone Australia customers, the mobile data which is used with the Dream Lab software is free, so you won’t be charged any additional usage fees. For consumers which are not on the Vodafone network, standard mobile data fees will apply if the app is not run over WiFi. A smartphone is a tiny yet powerful computer. When it’s operating in idle mode, for example when you are sleeping or your phone is recharging, the power is unused and could be better put to use. 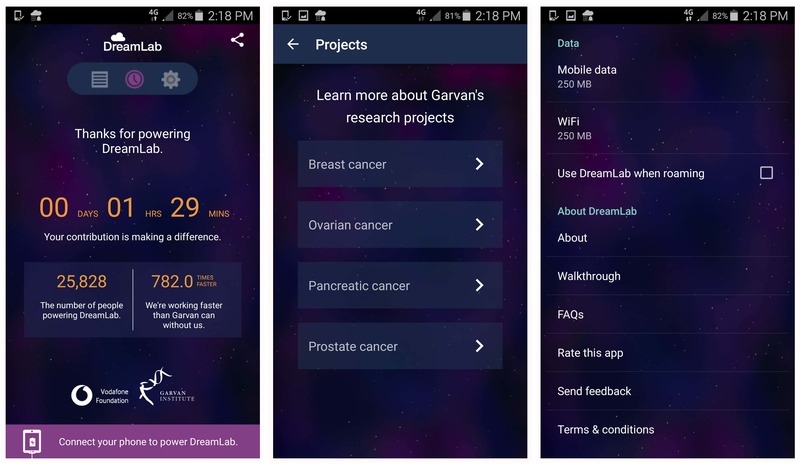 Dream Lab uses the power of your smartphone to speed up cancer research, by connecting the joined network of mobile phones which all have the app installed on them. Tiny research problems are then processed on each phone with the results being sent back to the research team. The app is small in size and runs in the background so you never notice any loss of speed of functionality on your smartphone. The app does not get access to your personal details and 100% safe to trust and use, coming from such a large brand as Vodafone. Dream Lab allows users of the application to decide which charity they would like to support, by selecting one of four different areas during the initial application setup process. The Garvan Institute of Medical Research and Vodafone Foundation Australia, have teamed up to work together on a distributed computing initiative, to help fight several different types of cancer. Together they both launched the Dream Lab application which runs on Android-based devices, be they smartphones or hand held tablets. Once the app is run, it allows the handsets owner to contribute the devices processing power, towards helping cancer research. By running the Dream Lab app on your smartphone as you sleep, you can help a worthwhile cause and help speed up the research of various different types of cancers, with no adverse effects to the life or usage of your smartphone. With thousands of mobile phones on the Vodafone network all connected using the app and harnessing the processing power, it’s as if the scientists had a super computer doing the work for them. The Vodafone Foundation and Dream Lab application allows scientists to continue with their work while in the process saving thousands of dollars and completing the process more efficiently.